*HOT DEAL* Over 50% Off Pacific Play Tents Teddy Bear Tee Pee & Cowboy Tee Pee! Oh this is so adorable — and Amazon has it marked down! Grab the Pacific Play Tents Teddy Bear Tee Pee for just $99.99! It’s currently selling at Target for $179.99! Grab this *HOT DEAL* now before the price shoots back up! Perfect gift for your little one’s imagination!!! Have a little cowboy instead of a cowgirl? 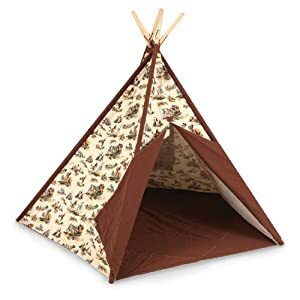 😉 Grab the Pacific Play Tents Cowboy Tee Pee for the same price! « 88% Off Betsey Johnson Button Snap Cinched Waist Hooded Cape + Free Shipping!